HP provides technology solutions to consumers, businesses and institutions across the globe. HP employs over 140,000 people in 178 countries doing business in more than 40 currencies and more than 10 languages. HP's focus on people underlies everything we do. Being known as a great place to work makes it easier to attract top talent. For us, being a great place to work is good business. HP people live for the big idea. The next great discovery. The new way of being. To us, "Invent" is more than a word. It's who we are. Tech for Tots brings toys to the US Marines Corp Toys for Tots Foundation toy drive at holiday time. Each person is encouraged to bring an unwrapped toy to this event, and help make the holidays a bit brighter for underprivileged children in the community. Take WITI's Women in Business Research Survey Today... Click Here for Details! Did you know that WITI Strategist subscribers can receive up to 20% OFF of their auto insurance from Geico (recently lowered rates in California). With more than 1,000 attendees and a plethora of innovative workshops, keynotes, roundtables and networking, WITI's 13th Annual Women and Technology Summit was an enormous success. In the next few issues of The Strategist we will highlight key findings and major takeaways from the conference. Click Here to View Photos from the Summit! More photos coming soon... If you have any pictures you would like to share with us from the Silicon Valley Conference, please upload them here. In an interesting trend, many of today's IT leaders lack the traditional technical from the ground up background of the past and instead benefit from a well-rounded business and technical resume. John Reale, CIO of USG, had a background in accounting, sales and customer service before he entered his company's technology division. The final move was something that he never really planned for himself. In the past, USG had looked outside to fill the CIO position. However, based on the endeavors that the company was undertaking and the need to more closely align the business objectives to IT, it was the right time to look internally. October 23, 2007 • San Diego, CA • Register Now! Telecommuting, Telework, Flexiplace workspace, satellite offices and an international workforce are just some of the trends extending the workplace beyond the office. Back in 1997, 12 million people in the US worked from home at least one day a month; by August 2005 more than 45 million worked from home at least one day a month. Both entrepreneur startup companies and industry heavyweights continue to develop new technologies to extend the workplace. Is the investment worthwhile? Studies from the Center for Women's Business Research suggest that woman business owners have a more difficult time securing financing for their businesses than their male counterparts do. The same studies suggest that women engage in purchasing decisions for technology, office space and other large expenditures slightly different than men do. WITI is interested in learning about your perspective on these subjects. We would like to invite you to participate in the attached survey so we can learn what you think about these subjects. 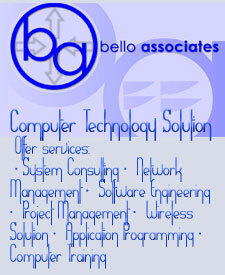 Bello Associates is a computer consulting company focusing exclusively on Network and System engagements by providing strategic consulting, creative design, and technology integration services to small-midrange businesses and individual/residences that want to exploit competitive advantages through network and system technologies. Accelerate Your Career! - Companies that get it are searching the resume database at WITI4Hire every day. Don't be overlooked! So, whether you are actively seeking a job or just open to great possibilities, add your resume today (FREE for members AND non-members, and confidential too!) to be noticed by companies like UBS, New York Times Digital, Best Buy, Altiris, Southern California Edison and GOJO Industries, Inc. Don't want to wait? Search for a Job on WITI4HIRE... Click Here! WITI Members: See the Members' Discount page for the promo code to receive special pricing. See all of the latest technologies in action at Interop New York, October 22-26, 2007. Visit 200+ exhibitors, attend 100+ sessions, and check out live demos of practical business solutions. Interop is the gathering place for business and IT leaders who want to find out what's next in business technology. CSI 2007, November 3-9 in Washington, DC, is the only conference/expo that delivers a business focused overview of enterprise security. It will convene 1,500+ delegates, 80 exhibitors and features 100+ sessions/seminars providing a roadmap for integrating policies and procedures with new tools and techniques. CSI has 17 topic themes, covering everything from awareness to risk to wireless. It puts you together with the decision makers who've kept their organizations out of the news. WITI members receive a $100 discount off the conference program by inserting the code WITI in the box marked Promotional Code. Companies large and small have been relying on innovative Oracle technology almost since the day the company was founded, 30 years ago. And Oracle OpenWorld, the world's largest event dedicated to helping enterprises understand and harness the power of information, is the best place to see that technology in action. Coming to San Francisco November 11-15, Oracle OpenWorld 2007 showcases the customers and partners whose innovation with Oracle translates to better business results-for their companies, and quite possibly for yours as well. Join WITI @ the United Nations! The anticipated 1,000+ VIP attendees will include management and IT executives, diplomats, officials, policy makers, and climate change experts, who represent the needs of global businesses and government. If you're in business, government, academia, or a non-profit, and want to know more about how Information and Communications Technologies can mitigate Climate Change, this conference is for you. We hope to see you and yours at the UN! Red Hot Holiday Mixer 2007! WITI Las Vegas June Event - SAVE THIS DATE!